What do Australia and Pakistan have most in common (apart from cricket)? One could argue that it’s salinity. If anything, the proportion of agricultural land affected by salinity is even more extensive in Pakistan than in Australia. Salinity visibly affects production on ~40 per cent of land in the south of the country and ~25 per cent of land in the north of the country, but it is a latent problem everywhere. 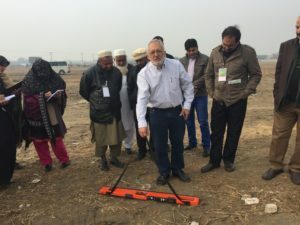 Another point of difference is that in Australia, farmers have the luxury of being able to avoid agriculture on their severely-saline land but in Pakistan, where land holdings are small, salt-affected land may still need to be cropped. Countries like Pakistan and Australia should both be at the forefront of saline agriculture. In January, Adjunct Associate Professor Ed Barrett-Lennard of the University of Western Australia, visited the University of Agriculture in Faisalabad to work with 15 cereal breeders and soil scientists to deliver a training course on ‘The phenotyping of cereals in variably saline landscapes’. Researchers had a chance to use the EM38—an instrument that can measure the apparent electrical conductivity of soil— both in a flat landscape with little soil surface variation, and in hills and valleys with underlying variation in salinity. The participants received an extensive series of lectures ranging from the interactions of salinity with waterlogging and drought, to the statistical analysis of trial results. “Our Crawford Fund sponsored training course focused on the phenotyping of cereals in variably saline landscapes,” said Dr Barrett-Lennard. “In many ways, it is the variation in salinity in the field that makes the selection of adapted crop varieties so difficult. Standing near the plot of high productivity, one has to ask the question: is growth here better because this variety of a crop is more salt tolerant, or is it better simply because the land is less saline?,” he said. Sorting out the answers to this question is the issue of phenotyping. “Fortunately, we now have the EM38—a tool to make phenotyping easier and that can assist plant breeders statistically remove the effect of variation in salinity from their plant variety trials,” said Dr Barrett-Lennard. “I believe that Pakistani and Australian researchers should be collaborating on saline agriculture more than ever. 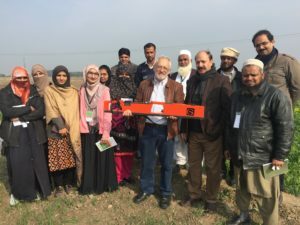 For the first time, thanks to Australian research, genes for improved salt tolerance in wheat are now ‘on the shelf’ and these should be rapidly introgressed into all Pakistani wheat lines,” said Professor Barrett-Lennard. “Tools like the EM38 will be crucial if we want to prove that these new lines can deliver better yields by improved pehonotyping,” he said.